Or rather – a footprint of the place to interfere with. A geographical, coordinates-bound place, as we once knew it seems to be gone as a ‘given’ thing. With the technology providing ‘distance influence’, we now have an almost metaphysical ‘place’ which can be influenced in many different ways. It can be made visible, invisible or even “hyper-visible” depending on the role it needs to play in the economic, political or social sense. Since they do not reside (solely) on a map anymore but in the intentions of the agents in which interest they lie, the certain locations, specifically, the locations of conflict, juxtaposed political interests or natural disasters, are prone to be used and abused. The World we live in now can be roughly divided into the First, Second and ‘The Third World’ (TTW) – the latter serving as a ‘resource bank’ for the first two, the TTW is a specific ‘permanent trauma’ space where wars are fought and economic interests are exercised. I will use a sarcastic description here: while the neoliberal First World inhabitants need to feel better about themselves when sipping on the matcha-late (fair trade one ;)) the “distance humanitarianism” is dully provided. In other words, the locations are bridged by technology, and we can donate money or time to the ones in need, without leaving our well-taken-care-of lives. 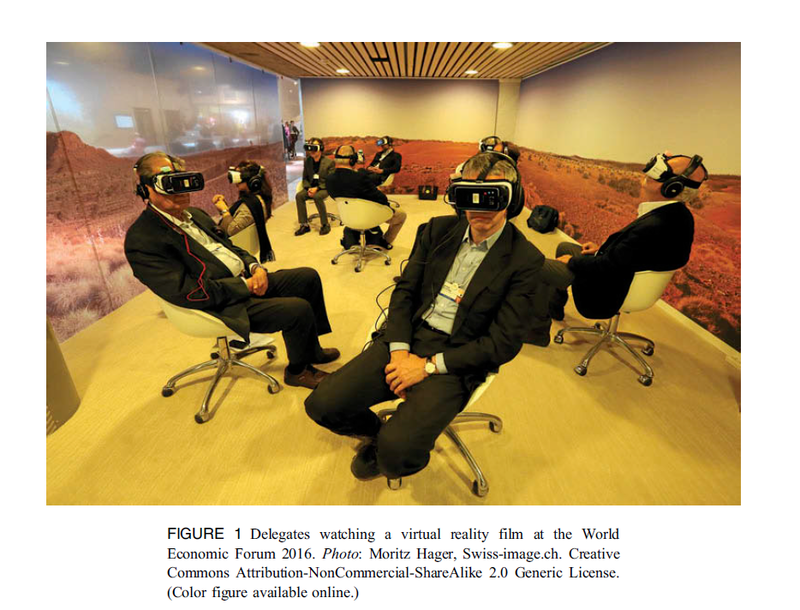 One of the most bizarre examples for that is the VR film shown to the top executives, in the leisure, time during an economic conference. In other words, money power is placed in a situation that should induce empathy through much-hyped (VR) technology possibilities. The image shows well what is really going on with the “witnessing crisis” – the nicely dressed men and women are shown a story about the Syrian girl in the “award-winning film”: Clouds Over Sydra in which the refugee girl basically performs for the audience’s compassion. From this example alone one can conclude how sensitive digital witnessing is to misinterpretation and abuse and which questions arise from the position of the witness in regard to the sensitive story and its location. In the text, the author focuses on three more examples of digital witnessing – an example of the city of Gwadar, Dronestagram (3) and Forensic Architecture (4) practice. Have you ever heard of Gwadar? Great question. Even the people living there have heard about it in many different ways. Namely, because the location is abused in the political sense. If you ask the Pakistani army or if you choose to ask the Baloch tribes you would get a completely different answer about the “importance of this location”. The Chinese investors offer the third. And finally, the Youtube videos (celebrating oddity as a way to virality) have a fourth approach to the place. The port of Gwadar is an example of a multi-layered location, made close and distant to various observers. It is a bizarre situation of a really small city made invisible to some and hyper-visible to some other. Of course, the digital witnessing, in this case, has to do solely with the political PR, and it stretches to the amount of power the resource showing it has. The abundance of data also brings in the multitude of meta-data (and fake news) that open a whole new space for research and the need for the formation of a novel objective stance. 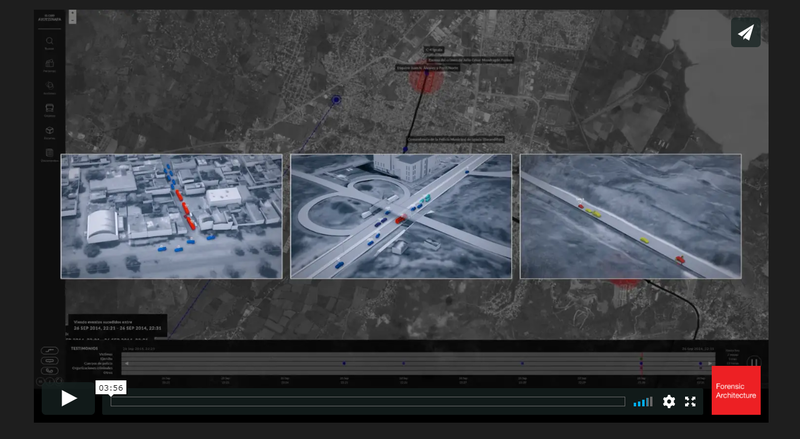 Forensic Architecture and Dronestagram combine visual and geopolitical data with investigative journalism to create a type of an “objective stance” that uses a scientific method to get closer to the various sensitive “truths” and raise issues to the light by collecting, piecing together and visualizing data. Forensic Architecture is an independent research agency based at Goldsmiths, University of London. Our interdisciplinary team of investigators includes architects, scholars, artists, filmmakers, software developers, investigative journalists, archaeologists, lawyers, and scientists. Our evidence is presented in political and legal forums, truth commissions, courts, and human rights reports.We also undertake historical and theoretical examinations of the history and present status of forensic practices in articulating notions of public truth. I have made the words bold to point out the complexity of practices and the approach that is dictated by the technologies we are faced with. Without the pieced-together and visualized evidence served to us from the data also available to us but incomprehensible (due to its amount, frequency and the curation) -we would just be endlessly scrolling within our bubbles and enjoy the (abovementioned) matcha-latte. Computational power reveals and hides at the same time. It is a colorful Chimera. Unless significant effort (or even illegal acts) are applied, we are witnesses to only what we are allowed to see. Closeness and distance are largely political. Technology is not a neutral nor a ‘ truth’ encompassing part of objective communication, but a powerful tool for twisting and tweaking the point of view, depending on who is deploying it and for which reasons. We are given so many eyes to so many places but we are data-choices-framed and the origins of the served data are very political. We are also held in the curated darkness over things we are “not supposed to see”… very tightly and violently so.